This memoir by Gloria Hildebrandt first appeared in Trinity Alumni Magazine, Spring 2018. Before Trinity I had the courage to approach my small town newspapers and begin doing freelance writing and photography. My first feature, at my editor’s suggestion, was on my father’s passion for leading orienteering backpacking trips in the wilderness of Ontario. Having done well enough in high school to be accepted to Trinity, I was therefore shocked to attend the first class of my first English course, Eng 108, 20th Century Literature, and be told that we couldn’t possibly expect to do well in that class if we hadn’t read the literature and studied the art of all the centuries that preceded it. The professor was Douglas Chambers, who also told us not to expect numerical marks on our essays; he would give comments only. Some students transferred out of the class. I was intrigued and remained. It seemed rather counter-culture and hippie-like; this was 1975 after all. Professor Chambers gave evening tutorials in his gorgeous house in Cabbagetown. Some of us had to sit on the carpeted floor. We were treated like adults at a party; we were offered refreshments. Eng 108 taught by Professor Chambers was the single most influential course I ever took. The works we read pried my mind wide open: by Yeats, Eliot, Lawrence, Woolf, Joyce, Stevens, Williams, Hughes and others. More than 40 years later, bits of poetry from that course still sometimes float around my mind, especially lines that refer to circularity. “In my end is my beginning.” (T.S. Eliot, Four Quartets). “Turning and turning in the widening gyre/The falcon cannot hear the falconer. (W.B. Yeats, “The Second Coming”). While at U. of T. I tried to continue with my journalism. Alas, The Varsity news department alarmed me by wanting intense campus political reporting, which was not my thing. Trying the arts section, I was told that I would be expected to go onstage while Mick Jagger for example, was performing and take photos of his famous mouth by sticking my camera right in his face. As a very young woman from the country near Georgetown, that was far too intimidating. So The Varsity was out. I had more luck with the Trinity Review, having several of my short stories published in it. I began to think my future as a writer lay in fiction. I decided to specialize in English literature so I could read everything that had already been written. Upon graduation I was very well read and educated, but lacked practical skills and the self confidence to start an impressive career. I needed a job while I wrote novels and short stories on the side. I got a clerical job at a solid company in downtown Toronto but I failed to become a fiction writer. I studied magazine journalism at Ryerson, learning a trade after getting my education. One of the courses required us to plan our own magazine. How stupid, I thought, as it had no relevance to me. Nevertheless I did that assignment and completed all the courses for the certificate in magazine journalism. Sensing a dead end at the company where I worked, I decided to try freelance writing full time. My first national magazine assignment was for Flare, again featuring my father’s orienteering backpacking trips. I had completed one orbit of my life’s spiral, returning to the topic of my first newspaper piece. Freelance writing for magazines became my vocation. It was a constant financial struggle, but I couldn’t bear to do anything else. In 1992 I circled back to the country north of Georgetown, after my parents helped me build a small house near them. With a mortgage to pay, I continued to freelance, now also for corporations that pay better, and taught writing and literature courses part time at community colleges. I also got work editing local magazines. Then in 2003 I met someone who would go on to help me realize a dream that I wasn’t even aware of having. It wasn’t marriage, as I have never wanted to be married. Yet Mike turned out to be more of a keeper than my previous boyfriends, none of whom were a good match for me. Mike is an environmental engineer and was a town councillor, but I didn’t hold that against him because he also appreciates the arts. Other mutual interests we have are nature, plants and animals, the outdoors, the Bruce Trail. Another turn of the spiral, back to outdoor activities first experienced as a child with my parents. I invited Mike to accompany me on interviews for a local magazine I was editing, and to take photos. Our work was published together in the magazine and in 2007 we began discussing starting our own magazine. We could totally do it, I said. I’ll handle the editorial, you’ll take the photos and sell ads. Fortunately for me, he agreed. Yet another circuit on the spiral, ironically back to that apparently ridiculous Ryerson assignment about planning our own magazines. Who knew that that course would be prophetic? Here I was doing the very thing I had scorned as being impossible. 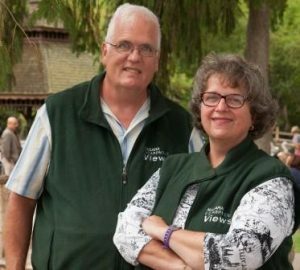 The magazine we founded is Niagara Escarpment Views, covering the communities all along the Niagara Escarpment in Canada, from Niagara Falls to Tobermory and onto Manitoulin Island. We publish in-depth features on plants and animals, trails and waterways, art and gardens, community efforts and local treasures, all found on or near the Escarpment. It was a financial challenge at first. In the digital age, getting enough advertising to cover the expensive costs of a print magazine is difficult. Yet the positive response we receive to our issues is greatly encouraging. When you love what you do, you make it work. Things gradually became easier and this year the magazine reached its 10th anniversary. Print is not dead in our case. If we have a secret to our success, it is excellence, ethics and engagement. We are committed to excellence in magazine journalism, working hard to get things correct and beautifully photographed. We are committed to ethical business practices; we do what we say we will and treat everyone fairly. We see our audience engagement through many letters to the editor and hand-written notes on beautiful cards. They report keeping issues for a long time before passing them on to others. Those who subscribe tend to send photocopied mail-in forms rather than cutting up the magazine. We have a high subscription renewal rate. See this piece also at the online version of Trinity Alumni Magazine. Love this piece, so full of optimism and energy. Carry on!